University of Illinois PhD students Pongsakorn “Tum” Suppakittpaisarn, pictured above on the right, and Fatemeh Saeidi-Rizi, pictured above on the left, study rain gardens—but not in the way you’d expect. Instead of measuring infiltration rates and pollution reduction capacity, Tum and Fatemeh want to know what happens in our brains and bodies when we see this green infrastructure practice. A growing number of studies draw connections between access to green spaces and our physical and mental health. But, Tum said, most of that work has revolved around larger, more ubiquitous landscapes like public parks and tree-lined streets. So Tum and Fatemeh, along with collaborators at the University of Illinois’ Sustainability and Human Health Lab and the Health People-Health Landscape Lab at National Taiwan University, are working together to measure physical responses and changes in brain activity triggered by images of rain gardens. The team has compiled 216 rain garden photos taken across the U.S. into nine different videos. 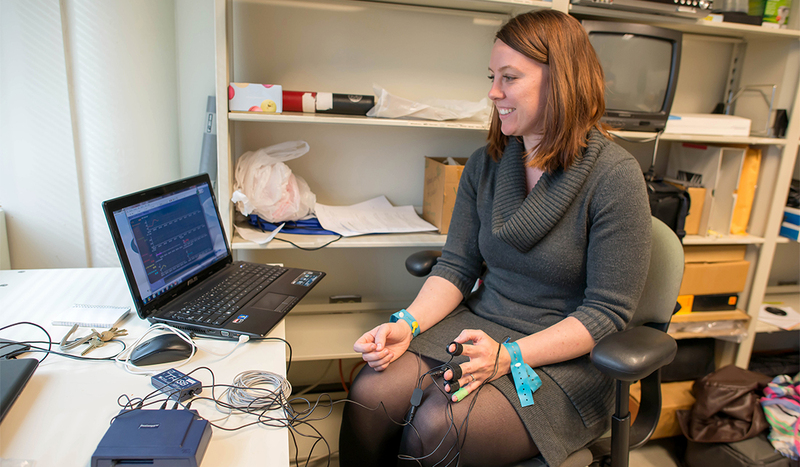 In Illinois, Tum will use biofeedback sensors to measure what happens to participant heart rates, body temperatures, and more when they see these videos. At the same time, Dr. Chun-Yen Chang’s team in Taiwan will use functional magnetic resonance imaging—better known as fMRI—to monitor and map changes in brain blood flow when participants are shown rain garden photos after being put through a series of tests designed to cause mental fatigue. The researchers only began testing participants this spring, but they have a few predictions about the final results.